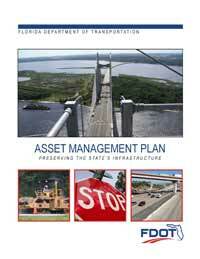 The Florida DOT TAMP and Technical Report is available here. Florida DOT summary: The Florida Transportation Asset Management Plan (TAMP) provides direction and an explanation of the processes and policies affecting pavement and bridge condition and performance in the State. Transportation Asset Management is typically defined as a strategic and systematic process of operating, maintaining, and improving physical assets effectively throughout their lifecycle. It focuses on business, economics, and engineering practices for resource allocation, project selection, and utilization, with the objective of informing decision making based upon quality information and well-defined objectives. This document includes the following sections: Asset Valuation, Current Methods and Tools, Financial Plan, Introduction, Inventory and Condition, Investment Strategies, Lifecycle Management, Objectives and Measures, Performance Assessment, Process Improvements, Risk Management.